Exhibit A. I was first introduced to the concept of situational awareness long before I knew the term. It was back in 1994. I was a third year law student and a member of Boston College Law School’s trial advocacy team. 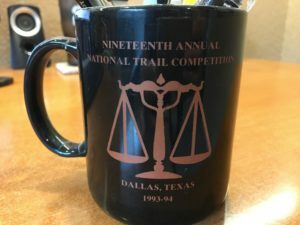 We were a strong group, winning the Northeast regional competition, so we were invited to participate in the National Trial Competition, which was held in Dallas that year. All the competitors and coaches were put up in a swanky hotel near the courthouse. There was no prize money and not many perks, but it was a great honor and an exciting way to start my life as a lawyer. I did a double-take. As you can see, I had read the words correctly. The commemorative mugs created for all the law student participants had a typo in the single most important word. Naturally, I grabbed a couple as souvenirs. Then I got to thinking. How many people, I wondered, had looked at this misspelling and thought, “Yeah, that’s okay?” First there must have been the typesetter; then someone else in the print shop probably approved the design; then somebody representing the competition likely signed off before it was printed on several hundred mugs; someone else opened the boxes at the hotel and created the mug pyramid I saw; and finally an event organizer smiled at the prospect of us eager law students reducing the pile to rubble. At each step, someone whose job included looking at the design saw the typo, but observed nothing, and therefore said nothing. I have no idea how many of my fellow 3Ls saw these mugs before I got to the table and started laughing. This is hardly an isolated incident. The fundamental problem with safety professionals piously advising the boots on the ground to be situationally aware is that people miss the easy stuff all the time. Exhibits B and C. Now that I am a lawyer whose practice concentrates on safety and security in public places, I give a lot of presentations and training sessions, often in hotel conference rooms. Sometimes, all I have to do is show up in order to get good new material. I was invited early last year to present at a week long conference about safety and security in public accommodations. The program was held in a reputable hotel in a major metropolitan area. That location was selected to be convenient for the program staff, whose home office was located nearby. Yet, despite all these advantages, they too slipped on a giant banana peel. When we instructors arrived, the screen on which we were to project our slides had been set up directly in front of the emergency exit doors. It was not hard to see this problem, as the Exit sign remained visible above the screen. Moreover, the entire purpose of the conference was to train venue and event professionals about safety and security issues in locations like this, so you would think there would have been heightened sensitivity to this sort of error. I leave it to you to decide whether the greater problem was that the hotel, for whom this was doubtless not their first rodeo, had blocked their own emergency exit, or that the program staff ignored three days of faculty mockery until they finally deigned to have the hazard removed.When I finished my duties that week, I figured that it was just a case of professional indifference or the absence of situational awareness. I was soon to be set straight. Two months later, I was asked to lead crowd manager training in another hotel conference room. Once again, the screen blocked the emergency exit doors. But this time, the obstruction was designed and built into the room. So add the architect and code officials who created and signed off as perhaps not as situationally aware as one might hope. Applying the definition is obviously the harder part. It’s fine to say that everyone should know what is going on around them, but as my ironic examples suggest, we would be wrong to assume that even people who have no function other than to be situationally aware actually do know what’s going on around them. Add the fact that many venue and event jobs are part-time, seasonal, hourly, and relatively low-paid and you have what one smart client of mine refers to as an “opportunity. Let’s begin our analysis with the right foundational question. Given that everyone has a legal duty to behave reasonably under the circumstances, it is logical to ask, What should a reasonable person do with such an opportunity? Some of the widely-discussed options to enhance safety and security these days include walk-through magnetometers or hand-wands to detect prohibited metal objects, additional security guards to expand bag checks and pat-downs, more off-duty law enforcement officers to add a uniformed presence to t-shirt security, and even Unmanned Aerial Vehicles (drones) to add eyes overhead or dogs to detect bombs or drugs. These are fine options, but they do little on their own to add situational awareness. Magnetometers must be calibrated, and can be adjusted to emphasize either sensitivity to prohibited items or speed to keep the line moving into the venue. Likewise with bag checks and pat-downs, the guards posted to the points of ingress might have varying knowledge of what is going on around them. (Ask me sometime for the adventures three of us had at a major arena using only our idle curiosity and a Wallet Ninja.) Cases have crossed my desk in which guards exhibited an allegedly insufficient understanding of when or how to use force on a guest, or how to eject someone from the premises. I do not mean to single out private security. To the contrary, I begin with them only because so many proposed security solutions require more guards. I am also a fan of technological enhancements that preserve objective information recorded in real time, such as comprehensive CCTV, drone footage, and incident reporting software. This sort of data is more reliable than witness accounts, making the job of a lawyer much easier. But even these tools rarely help prevent incidents — I like them because they help me distinguish who did right from who did wrong after the fact, in litigation. If a reasonable person looking to address the usual gaps in situational awareness cannot just spend his way out of the problem — if quality and not quantity is the answer — then where does one begin? Personally, I look to the wisdom of Van Halen. You probably know the story that back in the 1980s, the Van Halen tour rider specified that there be no brown M&Ms. Such rock and roll divas, right? But David Lee Roth explained in a video years later that it was a litmus test for the promoter, a proxy for the band asking if their huge tour set-up had been done safely and correctly. They figured that if the promoter was attentive to this silly demand in the middle of a long tour rider, then other details would be handled equally well. I like this approach. If I ask someone outright if they know what’s going on around them, of course they will confidently say Yes. Here’s a hint: when everyone answers a question the same way, it’s probably not a good question. So I look to see if the details are right. I typically ask for a venue’s emergency plan. If someone first has to find it, or blow dust off the cover, I consider that a clue. I will ask for a promoter’s severe weather plan — a blank stare is a bad sign for more than just storm readiness. And when someone hands me a contract to review, if it lacks some of the basic boilerplate that should be in every contract, that tells me that the drafter borrowed someone else’s document and didn’t recognize the significance of everything they were looking at, so they kept only the provisions they did understand. I ask for these things because they are important in and of themselves, and because they give me insight into the level of situational awareness of the people I’m dealing with that I cannot get by asking them directly. We work in an industry fraught with dangers, in which the consequences of not knowing what’s going on around us can include severe injury or death of workers, guests, and even bystanders. Because of the risks we live with every day, I think reasonable people should trust, but verify. Here is my view in a nutshell. People miss the easy stuff all the time. Therefore, the professionals responsible for safely hosting thousands of people out for a good time must provide staff with sufficient experience and training to do their jobs. And a reasonable organizer will take affirmative steps to ensure that those staff do know what’s going on around them.